Halifax Bank is featuring two characters from the Thunderbirds stop motion animation TV series in their advertising campaign promoting Halifax Savers Prize Draw Superdraw. British aristocrat Lady Penelope Creighton-Ward and her butler/chauffeur Aloysius Parker are shown driving through town in the pink bulletproof armoured FAB 1 limousine. Parker asks if he can make a quick stop at a Halifax branch. He goes into the branch with a letter and is amazed to discover he has won the top prize of £500,000 in the Halifax Savers Prize Draw Superdraw. When asked by a bank employee what he’ll spend the money on, Parker thinks hard. Then we see him on a beach, cocktail in hand, while his boss Lady Penelope, is back at the mansion ringing the bell for attention with him nowhere to be seen! Filmed in the Halifax branch in Marlow, Buckinghamshire, the Halifax Thunderbirds advert features Halifax colleagues as extras. This is the fourth in a series for Halifax bringing fictional animated characters to life and place them in the real world. The series began with Top Cat followed by Flintstones, Scooby Doo and now, Thunderbirds. 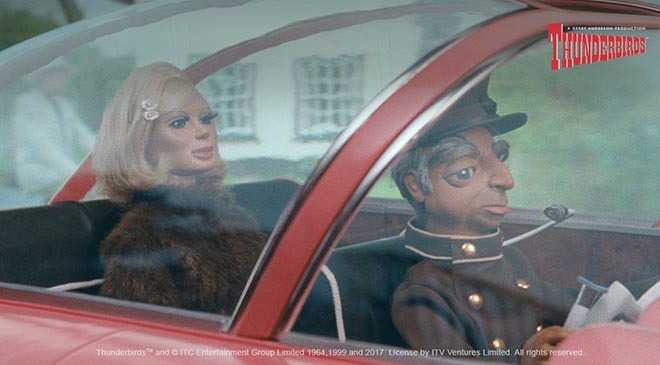 Parker and Lady Penelope will also feature on in-branch promotion, on outdoor posters and in digital advertising. Other characters from the series will appear on social media, including top tips for saving from Brains, aimed at encouraging young people to save. There will also be a special mobile savings game which will tour shopping centres in the UK, giving people the chance to play on a big screen and win prizes. The Halifax Thunderbirds campaign was developed at adam&eveDDB, London, by chief creative officer Richard Brim, group executive creative director Ben Tollett, agency producer Catherine Cullen, copywriter Jonathan John, art director David Mackersey, and chief strategy officer David Golding, account director Chloe Harding, head of account management Charlotte Wolfenden, account manager Katie Gough and acount executive Olivia Adamson. Filming was shot by directors Dom & Nic via Outsider, with producer John Madsen, production manager Steve Elgar, director of photography Alex Barber, and Thunderbirds consultant Stephen La Riviere. Puppetry was produced at Century 21 Films by puppeteers Andrew T. Smith, Geraldine Donaldson, Richard Gregory, Elliot Pavelin, Toby Chamberlain, and Hilton Fitzsimmons. Editor was Struan Clay at Final Cut with producer Frankie Elster. Visual effects and design were produced at The Mill by executive producer Alex Fitzgerald, producer Kirsty Ratcliffe, shoot supervisor/executive creative director Neil Davies, 2D lead artist Fergal Hendrick, shoot supervisor/3D lead artist Jonathan Wood, 3D lead artist Alex Hammond, 2D artists John Thornton, Gavin Marler, Nick Sze, Federico Ghetta, Zoe Cosh, James MacLachlan, Olivia O’Neil, Jose Caballero, Greg Spencer, Rebecca Clay, Adam Maynard, George Rockliffe, David Wishart, Richard Payne, Dan Adams, Gary Driver, Georgina Ford, Richard De Carteret, Sal Wilson, 3D artists Ashley Tilley, Giacomo Cavalletti, Sergio Xisto, Hitesh Patel, Peter Agg, Will Burdett, Matthew Kavanagh, Jasmine Ghoreishi, Tom Hales, Alberto Lara, Alain Thay, Adam Droy, Finlay Crowther, Arnau Gilabert, Joshua Barlow, Roberto Costas Fernandez, Andrew Bartholomew, matte painting team Rainer Stolle, German Casado, and Jiyoung Lee, art director Aurelien Ronceray, colorist David “Luddy” Ludlam, colour assist team Thomas Mangham and Brendan Buckingham. Sound was produced at 750mph by engineer Sam Ashwell.